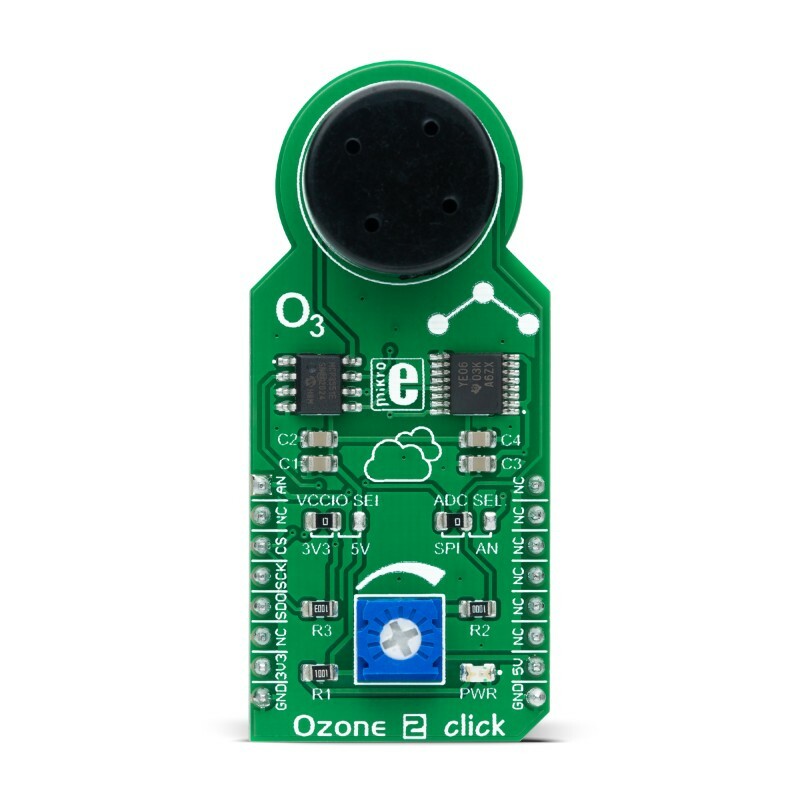 Ozone 2 click is an Ozone detection (O3) sensor, based on the MQ131 gas sensor. This gas sensor has a sensitive layer made of SnO2, which changes its resistance when exposed to ozone. The sensor is able to sense O3 concentration in the range of 10 ppm to 1000 ppm. The Click board™ is also equipped with a trimmer potentiometer, used to adjust the sensitivity and offset of the MQ131 sensor. Low cross-influence of other oxidation gases such as CL2 and NO2, ensures a good accuracy of the sensor. The analog output of the sensor is sampled by a high-resolution 22-bit A/D converter (ADC), which offers the conversion result on the SPI interface. The analog signal from the sensor is also available, allowing an external ADC to be used. Featuring an accurate 22-bit ADC and a high-quality O3 sensor protected by a stainless mesh, this Click board™ can be used in a range of applications used to measure or detect O3 gas concentrations in the atmosphere, for small testing equipment development, various warning systems for air quality / ozone pollution, and other similar applications that are used for the ozone concentration detection and monitoring. 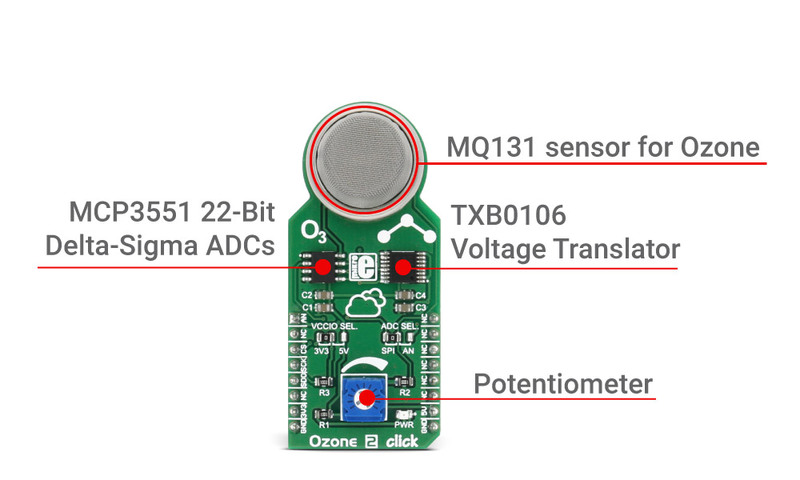 The main sensor component of the Ozone 2 click is the MQ131 ozone (O3) gas sensor from Hanwei Electronics, which uses the SnO2 (tin-oxide) alloy, which decreases its resistance while exposed to the O3 gas. The greater the O3 concentration is, the more conductive this material becomes. This can be utilized to obtain the O3 concentration readings. The sensor itself contains a small heating element, connected to 5V power supply. It needs to be preheated for 48h before it can perform as specified. The sensitivity of the sensor is given as the ratio between the resistance in air and the resistance in the O3 gas concentration of 50ppm, which is ≥ 3 (RO/RS ≥ 3). The sensor is protected against particles and mechanical damage by a stainless mesh, however, exposing to excessive moisture and corrosive gases can damage the inner structure. The measuring circuit consists of the MQ131 sensor, a power source and a load resistor (RL) between the output pin and GND. The sensor with its internal resistance forms a voltage divider with the load resistor. The RL is designed as a variable resistor, allowing the output voltage to be trimmed to the desired value. The calibration should be performed in controlled conditions, as the resistance of the sensor is affected by both the ambient temperature and humidity. 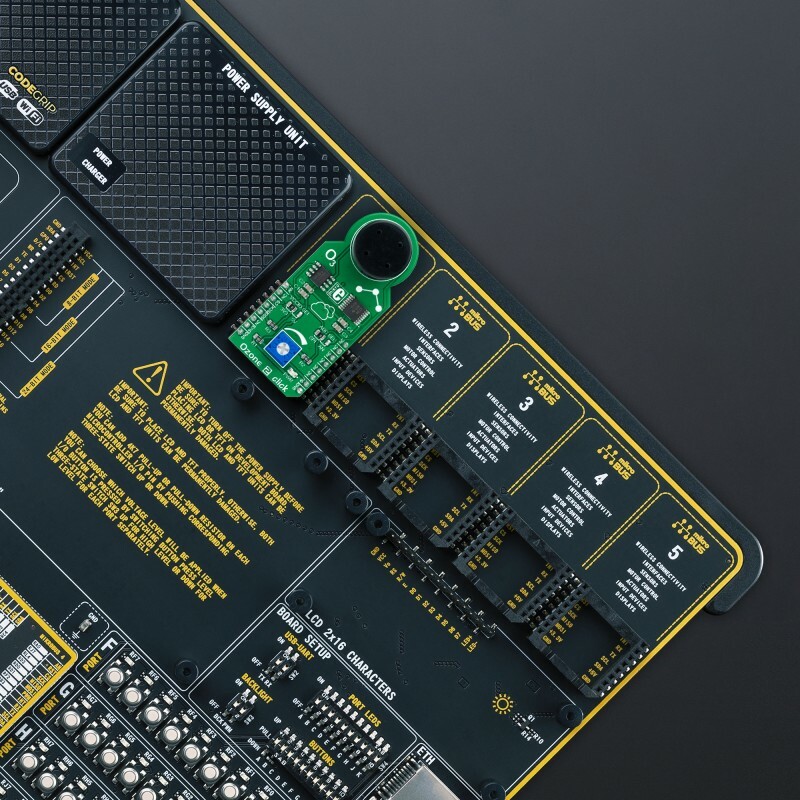 The sensor can be used to measure relative O3 concentration change without an accurate calibrating, which is useful for building applications that can be used as warning systems. The middle tap of the sensor-RL voltage divider is routed to an SMD jumper labeled as ADC SEL. This jumper can be used to redirect the measuring voltage either to the ADC for sampling or to the AN pin, so it can be used in an external circuitry (external ADC or some other form of measurement signal conditioning). VREF is the same as the power supply for this circuit, which means VREF = 5V, and the highest number written with 22 bits (FS) is 4,194,303. DATA is the 22-bit conversion value. As already mentioned, the ADC uses a 5V power supply. Therefore, this board needs a level conversion circuitry in order to be interfaced with 3.3V MCUs. 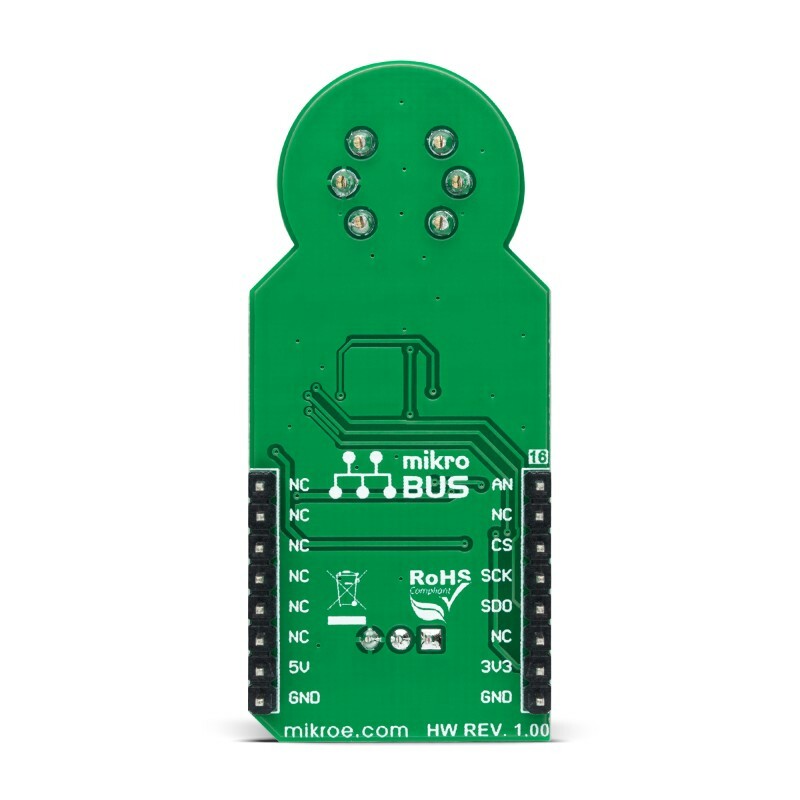 This Click board™ uses the TXB0106 IC, a 6-bit bidirectional level shifting IC from Texas Instruments, which is used to shift communication logic voltage levels from 5V to 3.3V. The voltage shift depends on the reference voltage on the VCCA pin, which can be selected with the SMD jumper, labeled as the VCCIO SEL. Applications It can be used in different Ozone concentration detectors for air quality control, or for gas leak detection. This table shows how the pinout on Ozone 2 click corresponds to the pinout on the mikroBUS™ socket (the latter shown in the two middle columns). 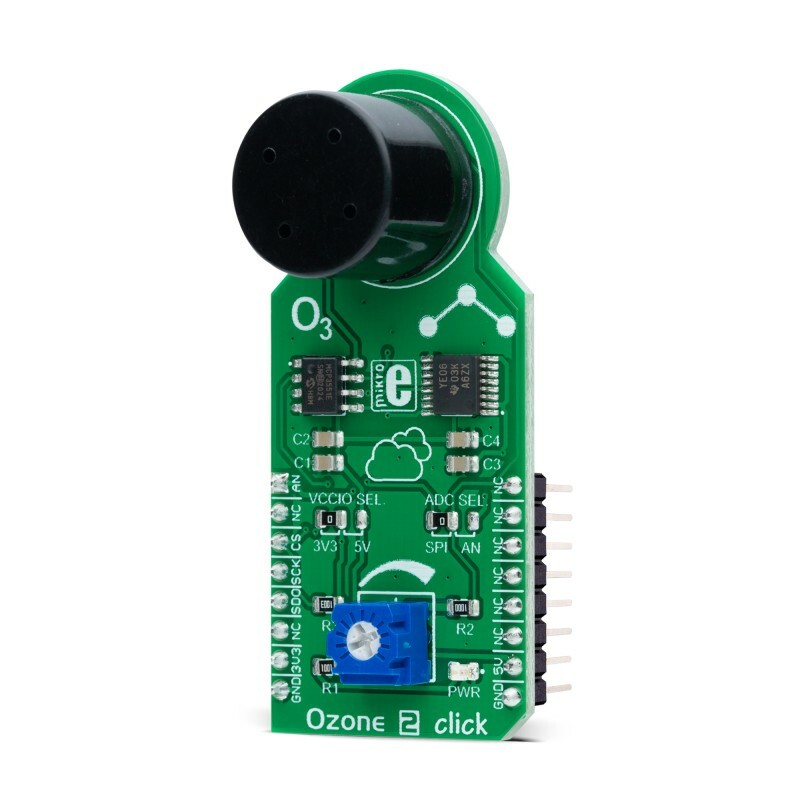 We provide a library for Ozone 2 click on our LibStock page, as well as a demo application (example), developed using MikroElektronika compilers. The demo can run on all the main MikroElektronika development boards. The library carries functions for initialization and reading the pa a digital value from MCP3351. Conversion of value to PPM is not covered by the library because it depends on the measurement environment. can be found in the datasheet.